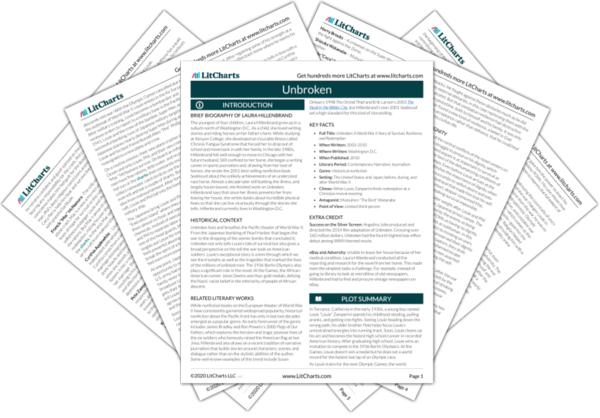 Instant downloads of all 946 LitChart PDFs (including Unbroken). Before dawn on May 27th, 1943, Louie runs a mile in 4:12, an incredibly fast time given that he was running in sand. That same day, his crew receives orders to search for a downed plane. Worried that Green Hornet won’t make it back to the base, Louie writes in his diary that if doesn’t come back in a week’s time, then his bunkmates can help themselves to the booze in his footlocker. One of the most tragic ironies of this book is that Louie – the model of physical fitness – will soon waste away as he starves on the raft. More broadly, this tragic irony encompasses all the solders who die in war despite their youth and good health. Louie’s note emphasizes the importance of alcohol to the soldiers; and foreshadows how alcohol will affect Louie’s life when he does eventually return. While flying over the Pacific, one of their engines suddenly blows out. One of the engineers onboard makes a mistake when trying to fix the engine, causing a second engine to blow out. With nothing else he can do, Phil tells the crew to prepare for the crash. The crash shows how there’s less glory in war than movies or propaganda normally depict. While it’s true that some soldiers will die heroically in battle, these men die a meaningless, unglorified death because of the engineer’s simple mistake. As they crash into the water, Louie thinks, “Nobody’s going to live through this.” The plane hits the ocean, blowing apart all around them. A tangle of wires ties Louie down, preventing him from escaping the sinking plane. Louie takes one last breath before the water covers him. He thinks a single word, “Hopeless,” and then blacks out. Louie’s negative, defeatist thinking combined with the violent shock of experiencing a plane crash weaken his resilience, causing him to stop fighting and give into black unconsciousness. As will soon become more clear, survival is in part psychological – Louie must believe he’ll survive in order to survive. Louie wakes up in total darkness and thinks that he must have died. Coming to his senses, he realizes, to his astonishment, that the wires are no longer tying him down. Louie escapes the debris and swims to the surface and into the dazzling daylight. He takes in a deep breath and then vomits all the salt water and fuel he had swallowed. Later, Louie will remember the inexplicable disappearance of the wires as evidence of God’s benevolent intervention into his life. Hillenbrand’s description of the moment heightens the religious quality of his experience – many religious narratives depict conversion as the movement between darkness into light, a metaphor apparent here as Louie emerges from the dark depths of the ocean and into the light. Plaue, Ethan. "Unbroken Chapter 11: “Nobody’s Going to Live Through This”." LitCharts. LitCharts LLC, 21 Aug 2015. Web. 24 Apr 2019. Plaue, Ethan. "Unbroken Chapter 11: “Nobody’s Going to Live Through This”." LitCharts LLC, August 21, 2015. Retrieved April 24, 2019. https://www.litcharts.com/lit/unbroken/chapter-11-nobody-s-going-to-live-through-this.